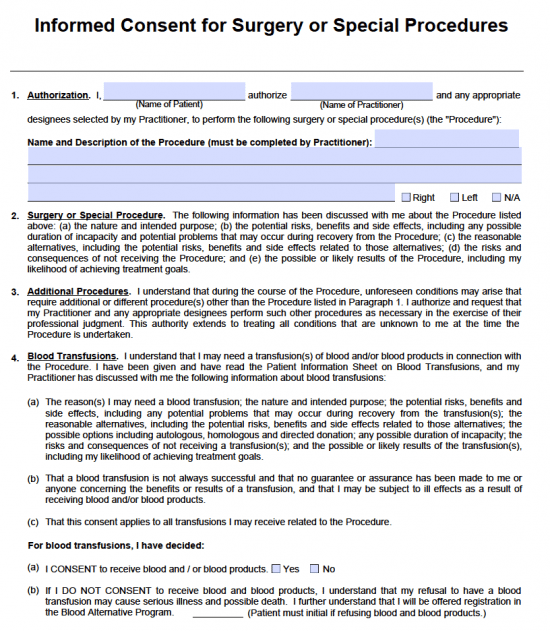 The surgery consent form is used to indicate that a patient receiving surgery or special procedures has been made aware of the nature of the operation, the risks involved, the required medication/anesthesia, and any other pertinent information that may effect their decision to consent. The patient must sign off taht they ahve had ample opportunity to field any questions they need answered and to address any concerns they might have going into the operation. The signature indicates that they believe they have enough information to classify their decision to have the operation as informed. Step 2 – The name of the patient and the name of the practitioner should be entered first. The surgery should be described and named by the practitioner in the paragraph field. Step 4 – The entire document should be read thoroughly by the patient and preferably by the patient’s attorney. The representative of the patient or the patient themselves will need to sign the document, and provide the date and time of their signature. Step 6 – The practitioner must sing the form as well along with the date and time of their signature.